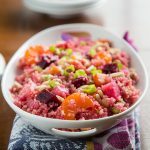 Red bell peppers, garlic, and the Middle Eastern spice blend za’atar give this creamy but low-fat white bean salad an amazing flavor. Chickpea salads are very popular in my household. My daughter E likes them so much that she often helps me throw them together, and we never use exactly the same formula twice. Over the weekend, I decided to really shake things up and, instead of chickpeas, make a bean salad from great northern beans. I had to wait until E was out of the house because she is not a fan of white beans, and true to form, she refused to even taste the salad. Oh well, more for me–and for husband D, who actually preferred it to chickpea salad. This salad gets its distinctive flavor from za’atar, a blend of spices popular in the Middle East. The exact formula varies from country to country but usually includes thyme, sumac, and sesame seeds, which are the spices I use here. If you can’t find za’atar (or zatar or zahatar) locally, you can order it online, but it’s very easy to make at home. Look for sumac (which is also indispensable for sprinkling on hummus) online or in Middle Eastern grocery stores. Serve this unusual salad over leafy greens, as a stuffing for pita bread, or as a dip for pitas or crackers. Place the bell pepper, celery, kohlrabi, green onions, parsley, and all but 1/2 cup of the beans into a large serving bowl. Place the remaining ingredients, including the reserved beans and juice of half a lemon, into a food processor, and blend until smooth. Add this dressing to the bowl and stir well to coat. Refrigerate until well chilled, at least an hour, but better the next day. Check seasonings and add more salt, lemon juice, and za’tar to taste. Serve sprinkled with additional parsley or za’tar. You can use about a cup of any crunch-providing vegetable or fruit instead of the kohlrabi. 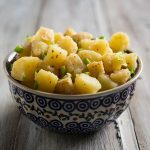 Water chestnuts or jicama would provide a neutral flavor while Asian pears or apples would contribute a hint of sweetness. I love beans and love Za’atar, so this is definitely a winner for me. And thanks for the mention! I’ve never heard of Za’atar, but it sounds yummy. Have you tried mashing it up to make it have a more hummus like consistency? Looks great. I love Middle Eastern food and am going to find myself some za’atar, pronto. Thanks for the info. This looks so amazing!! And adorable! I must try this!!!! I’m with E, and am horribly excited to make this recipe, but probably with chickpeas. 🙂 I love your bean salads and wait with a bit of (not-secret anymore!) anticipation for you to tackle ful medammis. This looks so good! Perfect for springtime! I have been looking for an excuse to stop in a little middle eastern grocery I pass by every day. I am going to pick up some Zatar and fresh pita after I pick up my daughter from school today. Should be a fun adventure for both of us! 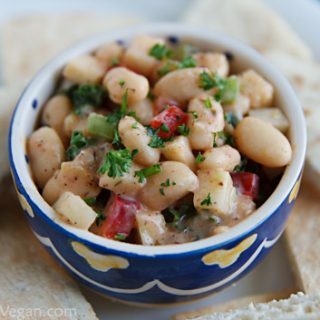 I love bean salads and am really looking foward to making this! Great recipe! I am getting the spices for my vegan cooking! I am a new vegan even though I never ate much meat. I just went off the meat, cold turkey (no pun intended) 🙁 And, am doing great! The chocolate cake on the top of your blog – does that have a recipe too? Is it dairyless?? Thank you! I am now a subscriber! Congrats on going cold turkey…um, cold tofu! 🙂 The chocolate cake recipe is here, https://blog.fatfreevegan.com/2010/07/chocolate-blueberry-cake.html , and it’s completely dairy free and very low fat. Thanks for becoming a subscriber. Be sure to take a look through my recipe index for lots more recipes! 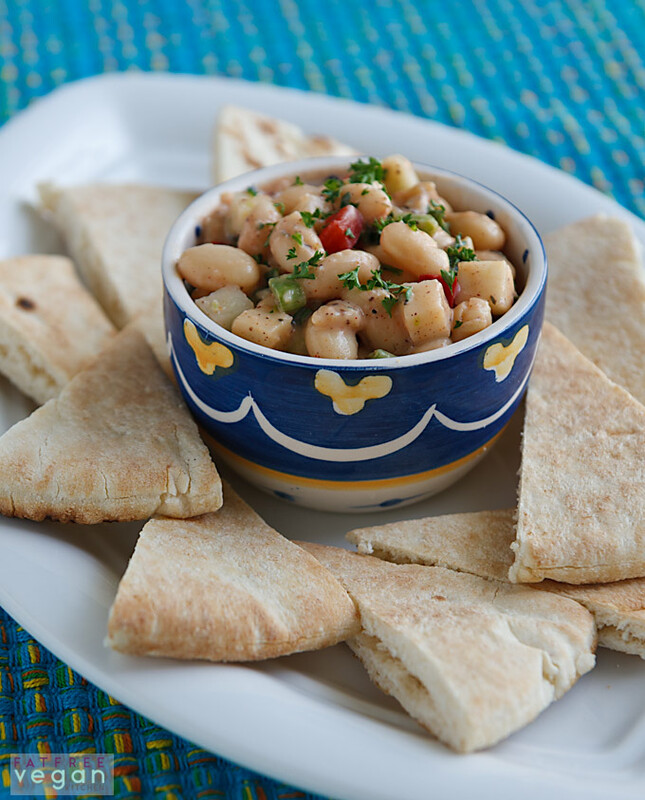 I love white beans – Northern beans are usually some of the least expensive at the store too. This salad looks delicious and perfect for spring. I’m imagining it spread on buttery crackers. I honestly love your blog. 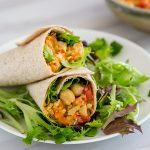 I am really avid about new recipes and all things health related and one of the things I really appreciate is that you post the calories for each recipe. When you say serving, how much do you consider one serving? Thanks so much! Honestly, the servings sizes vary depending on how many servings my family manages to get out of a dish. For this one, it could be 6 large servings (about a cup each) or 8-10 small ones. It really depends on how you’re using it and how much you generally eat. We used this to fill 3 pitas (6 halves) and to top 3 salads. I think you & your daughter should write a cooking book. I’ve made a few of your delicious recipes for my husband and I. We always end up having 2 servings. Thanks to you, it’s wonderful not having to worry about the fat content. Btw, what is Kohlrabi? Is it available in health food markets? Thanks, Grace! I’ll have to tell her you said that! I have a feeling that I would end up doing all the writing in that cookbook! 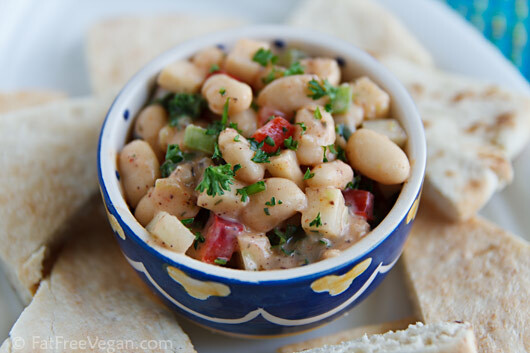 My fave beans are chickpeas, but great northern beans definitely come in at a close second. 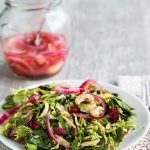 I almost fell off my chair when I saw this recipe had kohlrabi! My husband loves to eat it on its own, but I had never even heard of it before I met him. I will definitely be trying out this recipe. I’ve never had kohlrabi or za’tar before so I picked up both today. I can’t wait to make this! It sounds delicious. I hope you enjoy it! Be sure to peel the kohlrabi well so that all the tough fiber is gone. I found that out the hard way! Thanks for the tip on the kohlrabi! I tried a bite and it tastes like a mix of mild radish and jicama with a great crunch. Also subbed cucumber for the celery since it’s what I had. Used one can cannelini beans and one can great northern. I just tested it before putting it in the fridge and it tastes delicious! I can’t wait to enjoy it for lunch tomorrow. I may sprinkle some red pepper flakes on it since I love spicy food. Great recipe, thanks! Just love this dish, thanks for the recipe. Thanks Susan for a great posy. I love northern white beans and I love sumac even more. Funny thing is, I’ve never tried to make za’tar. Thank you for including the recipe. I will make za’tar to give it a try! I made this for dinner tonight w/apple instead of kohlrabi and it was great! I served it over lettuce, but must admit I added a bit extra tahini. Delicious! I did not have kohlrabi and I forgot to add the thyme (put in the sumac). I also had to use lime instead of lemon. It is so good and satisfying. We are doing the Dean Ornish diet, so I added just a tiny bit, maybe 1/3 of a teaspoon of tahini to the whole dressing. I think my husband will eat it all tonight, I better go get one more plate. I love your blog, it is literally a life saver for us.